1 Preheat oven to 200°C. Combine the cream cheese and 250g butter in the bowl of an electric mixer and beat with the paddle attachment on medium speed for 5 minutes, until light. Add 1 cup sugar and the vanilla, beat well, then mix in the flour until smooth. Wrap in cling film, then refrigerate for 2 hours. 2 Grind the poppy seeds in a mortar or coffee grinder, then set aside. Heat the remaining butter in a medium saucepan until browned, add the milk and remaining sugar, heat until simmering, then stir in the poppy seeds. Cook for 5 minutes, until thickened, then set aside until completely cooled. Beat in 3 eggs. 3 Roll out the pastry on a lightly floured board to3mm thick. Use an 8cm pastry cutter to make discs. Collect the scraps, re-roll, and cut again. 4 Beat the remaining egg. Arrange the pastry discs on a board and brush with egg. 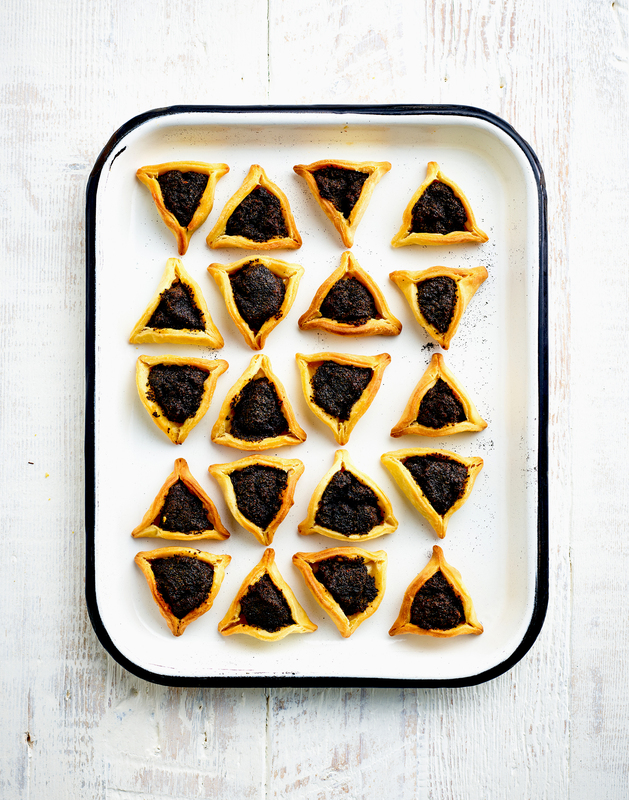 Place a spoonful of poppy seed mixture In the centre of each pastry disc, then fold over to form a three-pointed shape. 5 Arrange on a lined oven tray and bake for 20 minutes, until golden. Cool on a wire rack.